Indonesia Logistics Market has various organized and unorganized players consisting of a combination of shipping and international freight forwarders with that of courier providers mainly engaged in land transportation and total logistics services providers that operate a multimodal transport model. Players are turning into 3PL and adopting new technology to enhance their market share. Presently, there are more than 155 logistics and warehouse service provider in Indonesia. In 2010, Indonesia was ranked 75th in LPI index moving up to 59th position in 2012 which shows that the logistics industry of Indonesia has potential to grow. This growth occurred due to the country strongly investing in upgrading its transportation services, being open to collaboration, investments in infrastructure, various developments made by companies, government issuing 13 logistics policies packages, rise in logistics center and elevated e-commerce industry. 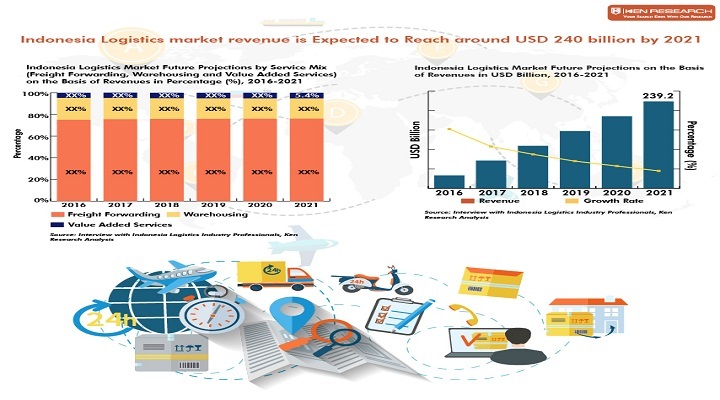 The freight forwarding market size has increased with the boost in air freight and sea freight, the development of transportation infrastructure and increase in number of freight forwarders, increasing industrial activities, growing FMCG market and rising e-commerce industry. The leading players in the industry are DHL, CEVA Logistics, Yusen Logistics, Agility Logistics and others. The market is expected to be driven by the industrial activities, growing E-commerce industry, rising purchasing power, elevated demand for food in the country, upcoming infrastructural projects in the country and continuous investment by the government in development of logistics. Air express logistics has dominated the Indonesia express logistics during 2016 owing to major international shipments falling in this category. B2B segment has dominated the express logistics market in Indonesia during 2016. The major players of Express logistic in Indonesia include DHL, FEDEX, First Logistics and JNE Express. Third party logistics segment has witnessed a robust growth in past few years in Indonesia. The leading companies in the segment are CEVA Logistics, Combi Logistics, Mitsui, APL Logistics, Kerry Logistics and others. 3PL market in Indonesia is expected to increase during the period 2016-2021 owing to the increasing focus of manufacturers on their core businesses and sub-contracting the activities where they have less expertise. The warehousing market in Indonesia is witnessing growth due to expansion in the FMCG sector, increase in the imported goods, increased demand for the outsourcing of warehouse services, rising e-commerce industry, Indonesian regulations relaxed for the foreign companies and increase in the warehouses and its capacity. The leading companies in the segment are Keppel Logistics, Oocl logistics, Samudera and others. The cold chain logistics market was dominated by cold storage in the country in 2016. Cold chain market in Indonesia is a concentrated market. PT. Diamond Cold Storage, Maersk Line, Wahana and GAC are the leading companies in the industry. The market will be majorly driven by increasing demand for perishable items including frozen food, pharmaceutical, meat, sea food and dairy products in the country.